Making your warehouse safer starts with educating your employees on rack safety. Order a free copy of this printed 24" x 36" poster to hang on a wall of your warehouse for everyone to see. It provides clear guidelines to help determine what should be addressed. Determine if a deflection should be addressed by using our simple 1-2-3 rule. 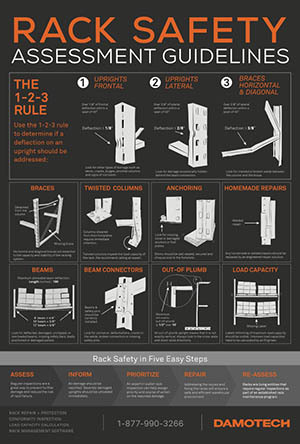 Rack guidelines based on ANSI/RMI, OSHA, FEM standards and recommendations. A reminder on the importance of regular inspections. Note: We will only ship posters to US & Canada. For other countries, please download a PDF version of the poster by filling out the form.